The following image is derived from a late 1950's Meccano dealers' cabinet display. It shows pretty much all of what you might consider to be standard Meccano parts. Click on any part in the picture for a whole page of information about that part. This project exists thanks to lots of people offering photographs of parts in their collection, without which it would have been simply impossible. I haven't been able to credit every single photograph in the detailed pages, but here is a list of the contributors so far. Contributors are listed according to the number of photographs they have provided (not necessarily the number of their photographs currently on the site). You should be able to work out how many photographs you need to send to gain each new level! 142 Rubber Ring, 3'' diam. Much of the information on the pages underneath these pictures is a result of diligent research by many people over the years. The starting point is "The Development of the Meccano System" (DMS) by R.R.Hauton and A.Hindemarsh, published by The Meccanoman's Club in 1972. There were two supplements to this work, in 1975 and 1982. The DMS catalogue was rearranged by Don Blakeborough, who added engineering drawings of each part and published the result as the Encyclopedia of Meccano Parts (EMP), which he publishes himself. Everything is also checked against the Hornby Companion volume 6 by Bert Love and Jim Gamble. Much more work has been done recently, and since the use of the internet has become more widespread these publications have been challenged in some areas and further examples of parts have come to light and been shared. William Irwin and Richard Payn have researched the 1978/79 period in more detail and have corrected this area substantially. Where I have come up against contradictions in compiling these lists I have sought further clarification from various experts on the Spanner group, and we hope to improve the accuracy and scope of the numbering system on a continual basis. It goes without saying that I will probably have introduced errors of my own while compiling these pages, and of course they will be my fault. If you find any errors or omissions, please contact us and together we will be able to make this as accurate as possible. Note: many obsolete parts can still be reached through the 'standard' parts. For example, octagonal couplings are on the same page as the standard couplings, and sand rollers are on the same page as the wood roller. If in doubt, type the part number into the box at the top right of the page and click on "Go!" to find a part. Very early on in Meccano's history, competitors tried to jump on the bandwagon and copy Hornby's great idea. It's estimated there have been as many as 600 different products made that are based on the original idea of bolting together parts with holes in them. In the early days, Frank Hornby spent a huge amount of time and money chasing one US product in particular, American Model Builder. He won, eventually, but as usual the only real winners were the lawyers. However, these products caused Meccano to start marking all their parts, almost obsessively in some cases. This makes life as a Meccano collector much easier! As a general rule, just about all Meccano parts are stamped with the word Meccano. There are plenty of exceptions, but this is the easiest way to be certain. Nickel-plated parts weren't always stamped before or during World War I, but from then on just about every part that was painted (red, green, whatever) has been stamped. If you have a green or red or zinc part that doesn't say Meccano on it it's almost certainly not Meccano. Another very convenient event helps us into the next decade. In 1921 the French government decreed that all products sold in France must have their country of manufacture identified. As France was an important export market, Meccano started stamping all sorts of parts with the words "Fabrique en Angleterre" (Made in England). A surprising number of new Meccano collectors believe that these markings identify French parts, but of course they don't! They would say "Fabrique en France" if they were (although French parts if they were stamped differently tended to be stamped "Meccano France"). This law continued until 1926, although markings continued for some time after this (and stocks were slowly used up too, of course). I have a December 1927 outfit where many parts are of the new double-tapped variety, stamped 'Meccano', and others are single-tapped and stamped "Fabrique en Angleterre". The change in stamping is closely related to the change from single to double-tapping, although it's not exact. 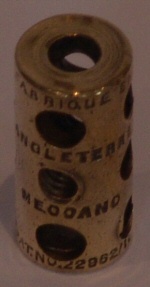 There are double-tapped parts stamped in the older style. During the 20's, much brassware was stamped with at least the word "Meccano", and these parts are desirable to collectors. Subtle changes to the style of stampings can help to date a part, but they are not always absolutely reliable. Although parts were made in France in a small factory during the 20's, and were stamped "Meccano France", the major French factory in Bobigny wasn't built until 1930. The French factory at this stage supplied many of the export markets as well as its own. The Liverpool was quite busy enough keeping up with the enormous demand in the UK. After the Second World War, the emphasis was on export sales to provide much-needed foreign currency. 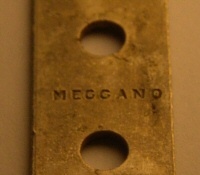 The stamping changed to "Meccano Made in England", which identifies post-war parts easily. This stamping carried on right through to the end of the Silver/yellow/black era. Note, however, that flexible plates, particularly towards the end of this period, are very lightly stamped indeed and can be almost invisible. 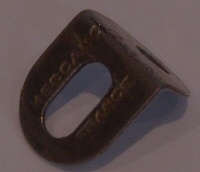 Markings changed to "Meccano England" starting with the zinc period (from 1970). This continued into the Dark blue period, but several authoritative voices have suggested that not all genuine dark blue Meccano is stamped at all. Fortunately for collectors, there is very little 'fake' dark blue in the world, so this is normally not an issue. STOP PRESS: Richard Payn disagrees and states that all dark blue is indeed stamped, although some of it very lightly, and not always on some 3'', 3½'', 4½'', and 9½'' strips (as they were cut from longer strips). There are replicas around particularly of the longer angle girders and flat girders, which were always in short supply.